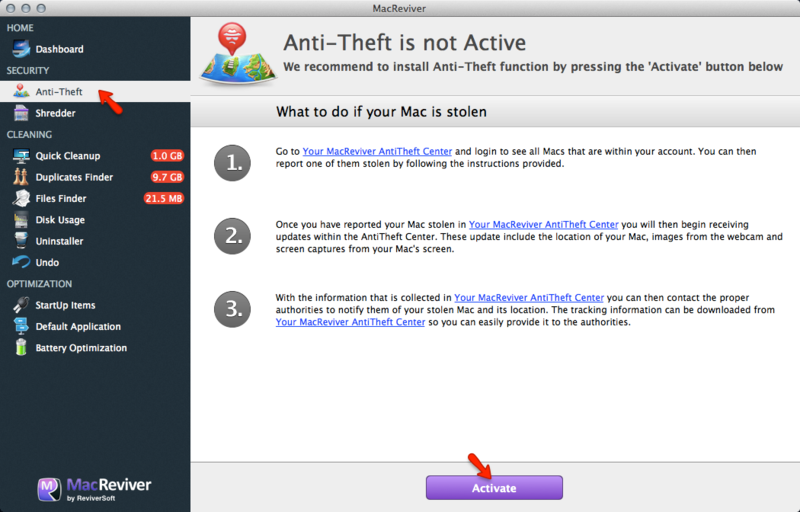 How do I activate and use the AntiTheft Center using MacReviver to track my Mac in case it is stolen? See all the Macs in your account from our web-based MacReviver Anti-Theft Center. Use the Anti-Theft Center from any computer to report that your Mac is stolen. Receive updates about the location of the stolen Mac, images from the webcam and screen captures from the screen. Collect this info and use it to contact the proper authorities and retrieve your Mac. You can then access the Anti-Theft center by clicking the link on this screen or going to ReviverSoft.com and accessing the My Account area. How do I use Quick Cleanup to clean unnecessary files in MacReviver? How do I use Disk Usage to find the folders and files that take up the most space in MacReviver? How do I use Duplicates Finder to remove duplicate files in MacReviver? How do I use Files Finder to find large files, or any files, in MacReviver? How do I use Junk File Cleaner to remove the trash and temporary files in MacReviver?